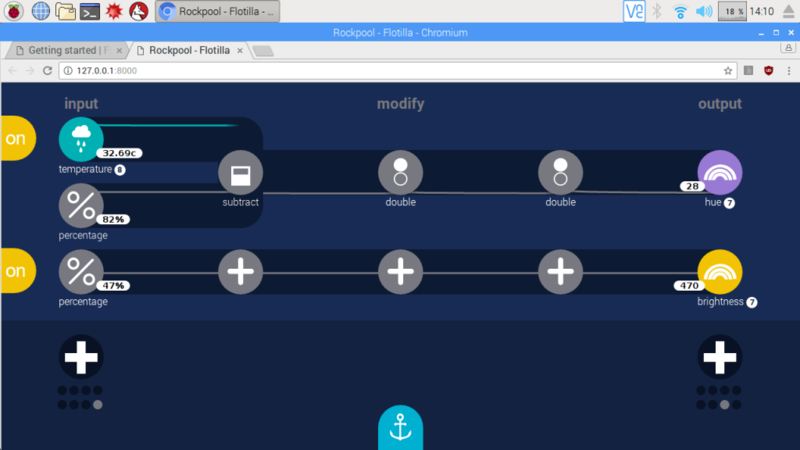 Rediscovering Flotilla | Blog My Wiki! 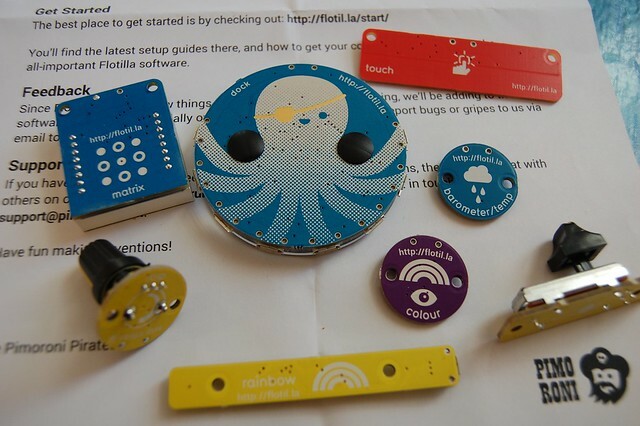 Back in 2015 I backed Pimoroni’s Flotilla modular physical computing devices on Kickstarter and got an early set. I had some fun exploring it, but the software and support materials weren”t quite ready at the time and I started a new job where I spent most of my time in KS3 and KS4 and my Flotilla kit lay neglected. 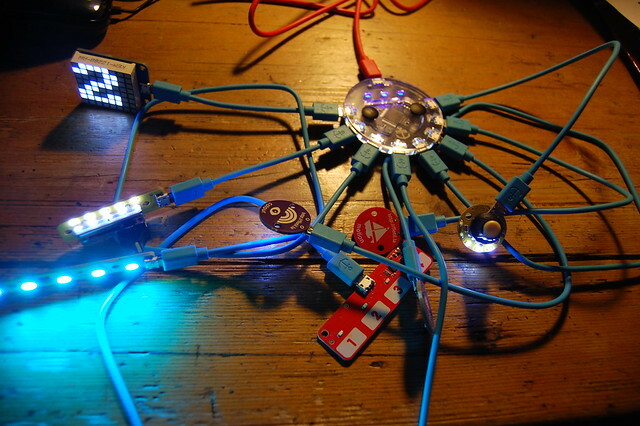 I’m about to start a new job as a primary school digital learning co-ordinator, and so I dug out my Flotilla bits as I they might be useful teaching physical computing in a simple way with attractive modular components. 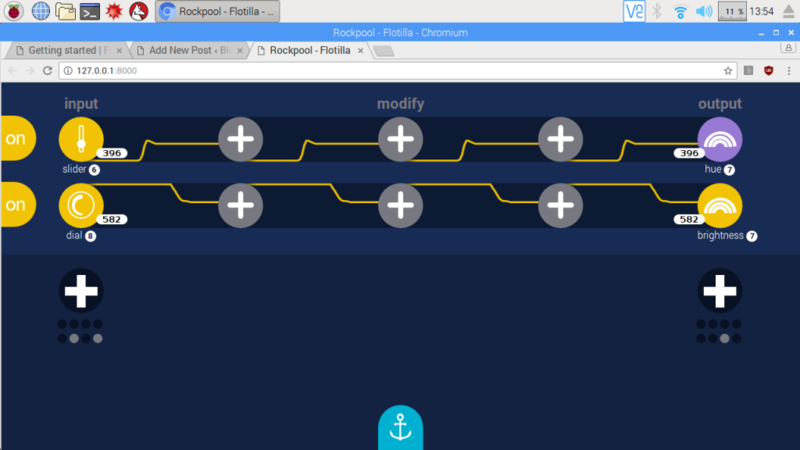 This process updated the firmware on the Flotilla ‘dock’ – the main hub all the tentacles and sensors and output devices plug into, and it also installs all the software. 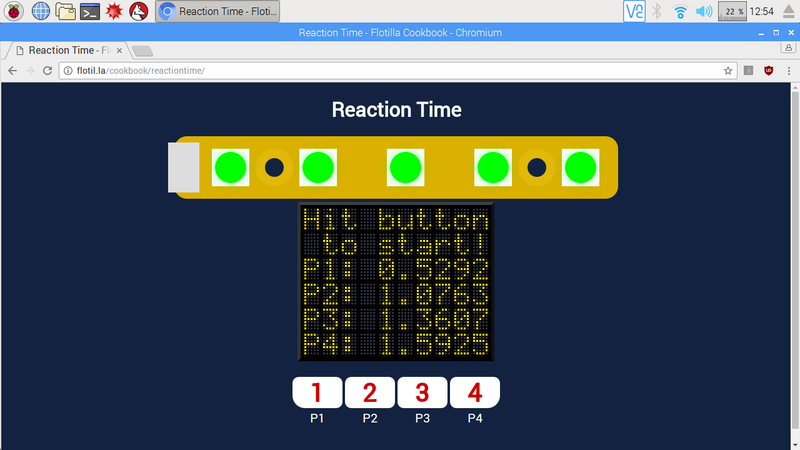 The Reaction Time game is one of the simplest to set up and worked really well. The Rainbow LED lights change colour after a pause and up to 4 players compete to press their button first. I really enjoyed the Marble Maze – tilt to guide a ball round a maze. 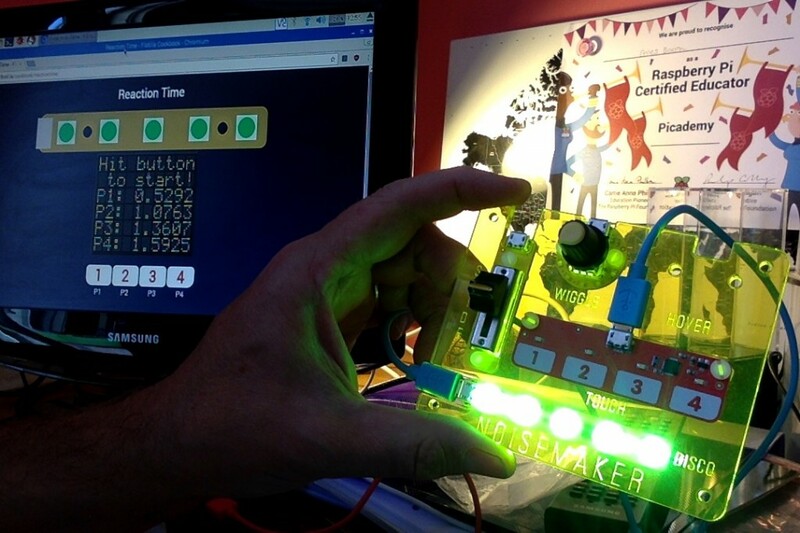 Nothing you can’t do with a BBC Microbit, but the 8×8 matrix display is very bright and there’s something very pleasing about sticking a motion sensor on the back of it with blutak, discovering you have it on back to front and making your own little widget. Bat and Ball (Pong) just using a slider and rotary knob as paddles was surprisingly addictive too. The second way of using your Flotilla is Rockpool – this does not require internet access, it runs as a local service in browser, and appears as under ‘Programming’ and ‘Education’ in the Raspberry Pi start menu. I did find that if I took browser focus away from Rockpool it really slowed down, but generally it worked well. You can do a lot here to make machines that work in real time, but – unless I’m missing something – there is no actual ‘programming’ here; you can’t make IF, THEN decisions and as such I don’t think you can create a game in Rockpool. I’m happy to be corrected if I’m wrong. I would love to give these toys to a small group of KS2 children to see what they can make – children are always far more creative and imaginative than me. The Third Way is to use the Python IDE. I’ve not looked at this yet, but it would clearly address the lack of traditional programming. However, I sense a bit of a problem here. The Flotilla modules are beautifully-designed, highly attractive, tactile and will appeal very much to primary school age children, it will teach them about inputs and outputs, sensors and physical computing devices. – but it does not seem teach them programming in terms of sequence or selection. Python may be beyond the reach of most Primary aged children (although I intend to try to challenge this idea in my own teaching next year). I think to be truly successful, Flotilla needs some kind of block programming environment (if one doesn’t already exist) to enable Primary aged children to not only make their own physical computing devices but program them in a way that supports the Computing curriculum. This entry was posted in computers, education, ICT, Raspberry Pi, Raspbian and tagged education, Flotilla, physical computing, Pimoroni. Bookmark the permalink. 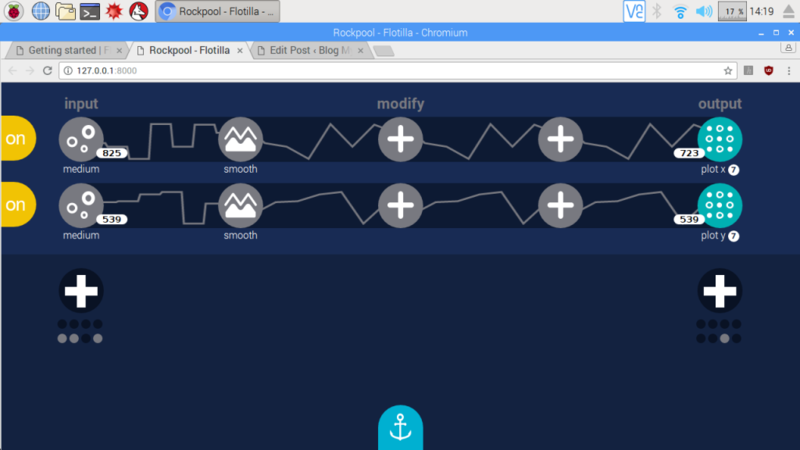 Looks really promising – could bridge the gap between Rockpool and Python.